Coppice are Noé Cuéllar and Joseph Kramer. On Holes/Tract the Chicago-based duo have created an intriguing record that has the ability to slowly bend the reality surrounding us, making it much more viscous, sometimes even difficult to breathe. Coppicing is a technique to cut back young trees to allow for growing back in a more dense form and is very beneficial for biodiversity. According to Kramer, the name of the duo is chosen because of their “interest in the word and the practice, particularly the idea of constantly cutting back for refraction and growth, of highlighting certain aspects at the expense of others - which is how we prefer to think of our process to date”. Continuously being on the edge of abrasiveness, they manage to handle potentially ear deafening noises sounding gentle and almost clean. It even sometimes reminded me of early Whitehouse, and then mainly the pure sounds and atmosphere. Expanding on that comparison, the 4 tracks possibly sounds as if the Buchenwald tracks were stored submerged for a few decades, in an imaginary expensive oak barrel where they got the chance to age well. As if all of the original ferocity is gone, and wisdom took its place. 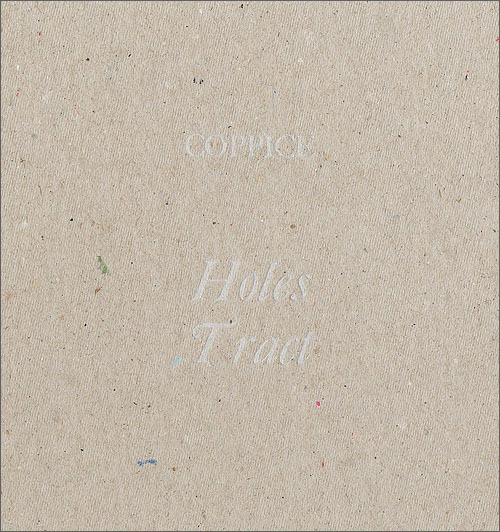 However, instead of mentioning influences, Coppice tends to try to focus more on their perception of the effects of the music, as opposed to any overt stylist references. The coppice technique as a metaphor for cutting back old school noise and forcing it to grow new forms and shapes.